For over a 150 years, Singer has been a leader in innovations that make sewing simpler and easier for both professionals and homemakers. This company was the first to manufacture a portable sewing machine, the zigzag machine, and a computer controlled machine, so it only stands to reason that Singer would also make a fine serger. 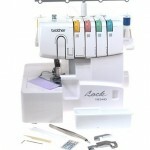 One of their popular sergers is the Singer 14CG754 Pro Finish 2-3-4 Thread Serger With Machine Intro DVD. The Singer 14CG754 Serger appears to be a very sturdy machine for an incredibly low price, as far as sergers go. It is appears to be ideal for those looking for an extremely affordable serger that can do the basic stitches, and it is easy to use. Reviews for the Singer Pro Finish Serger are very good, but not outstanding. In some cases, this may be due to the fact that some customers are comparing this serger to other sergers that sell for the twice the price. Some customers complain that this serger is difficult to thread, while others state that it is extremely easy. The contradiction may simply be due to some people’s expectation that sergers are known to be difficult to thread. The Singer Pro Finish 14CG754 Serger is one of the most affordable machines on the market, and it appears that most customers find that it meets their needs easily.